You could become trapped by the windshield wipers if they start moving while cleaning the windshield or wiper blades. There is a risk of injury. Always switch off the windshield wipers and the ignition before cleaning the windshield or wiper blades. ■ Clean the inside and outside of the windows with a damp cloth and a cleaning product that is recommended and approved by Mercedes-Benz. ■ Fold the windshield wiper arms away from the windshield. ■ Carefully clean the wiper blades with a damp cloth. ■ Fold the windshield wiper arms back again before switching on the ignition. ■ Clean the plastic lenses of the exterior lighting using a wet sponge and a mild cleaning agent, e.g. Mercedes-Benz car shampoo or cleaning cloths. Only use cleaning agents or cleaning cloths that are suitable for plastic lenses. Unsuitable cleaning agents or cleaning cloths could scratch or damage the plastic lenses of the mirror turn signals. ■ Clean the plastic lenses of the mirror turn signals in the exterior mirror housing using a wet sponge and mild cleaning agent, e.g. Clean sensors 1 of the driving systems with water, car shampoo and a soft cloth. ■ Use clear water and a soft cloth to clean camera lens 1. The cover of the 360° camera opens. ■ To clean the 360° camera: clean camera lens 1 with clean water and a soft cloth. If you are traveling faster than 20 mph (30 km/h) or the SmartKey is in position 0 or 1 in the ignition lock, the cover of the 360° camera closes automatically. Impurities combined with the effects of road grit and corrosive environmental factors may cause flash rust to form on the surface. You can restore the original shine of the exhaust pipe by cleaning it regularly, especially in winter and after washing. 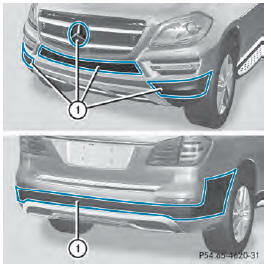 ■ Clean the exhaust pipe with a chrome care product tested and approved by Mercedes- Benz. Dispose of rags soaked in oil and grease in an environmentally responsible manner. Do not clean the ball coupling with a power washer. Do not use solvents. ■ Remove rust on the ball of the ball coupling, e.g. with a wire brush. ■ Remove dirt with a clean, lint-free cloth or a brush. ■ After cleaning, lightly oil or grease ball coupling 1. ■ Check that the vehicle's trailer tow hitch is working properly.